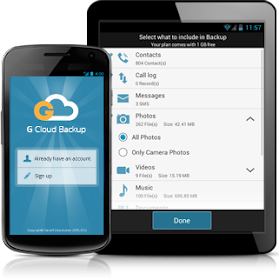 However, G Cloud does not sync your data across multiple Android devices; it only provides a Backup and Restore solution for all your device data (Contacts, Call logs, Messages, Documents,Media, Photos, Settings and your Browser Data). On the other hand, the G Cloud account you create is a global one that you can use across all your devices. So you can back up data from one device and restore the same data in other devices. The only thing is, you have to do the backup and restore operations manually. G Cloud monitors your battery health and only backs up data when your device is plugged-in (charging) or your battery has enough power. It will automatically stop backup operation if the battery level falls below a specific (user-defined) percentage and resume again when the battery is sufficiently charged up.